Just outside the borders of one of America’s largest metropolises lies an ecological wonder: the Santa Monica Mountains National Recreation Area, located in northwest Los Angeles and Ventura counties, includes 154,000 acres of rugged chaparral and delicate coastal sage scrub communities. It’s home to rare plants found nowhere else on Earth, a federally-protected frog, bobcats, and mountain lions. But an unprecedented fire earlier this month has thrown this unique wilderness area’s future into uncertainty. The Woolsey Fire torched nearly 100,000 acres in Los Angeles and Ventura counties before it was fully contained on November 21. And a huge amount of the burnt acreage fell within the Santa Monica Mountains. 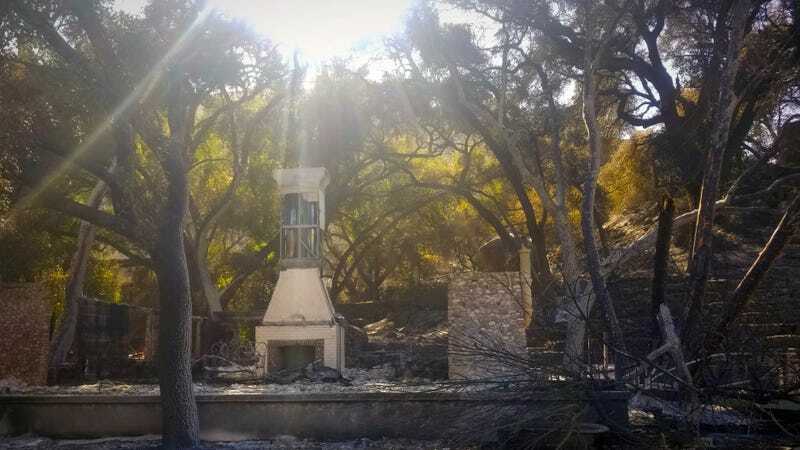 All told, 47 percent of the recreation area jointly managed by federal, state and local agencies was singed by flames according to data the National Park Service (NPS) provided Earther. Within the 24,000-acre section owned and managed by NPS specifically, that number jumps to 88 percent. “This is the biggest [fire] in recorded history in the National Recreation Area,” Mark Mendelsohn, an NPS vegetation and wildlife biologist working in the Santa Monica Mountains, told Earther. Scientists like Mendelsohn have been doing survey work across the park for about the last two weeks to assess the damage. Within the fire perimeter they’ve found a mosaic of burn severities. About 28 percent of the land was lightly burned, another 60 percent saw moderate burn damage, and about 1 percent has become a fully-torched moonscape. This kind of a patchwork isn’t necessarily a bad thing from a recovery perspective, Mendelsohn said, noting that a complete burn can facilitate the regeneration of certain plant species, while unburned patches can offer a refuge for wildlife. One of four baby mountain lions discovered in the Santa Monica Mountains earlier this year. News on the wildlife front has been mixed as well. All four bobcats the NPS tracks with GPS collars survived the fire, as did 12 out of the region’s 13 GPS-collared mountain lions. Sadly one young mountain lion, P-74, was presumed dead Monday after his collar hadn’t beeped since November 9. Smaller animals might have had more trouble escaping the flames. Mendelsohn said the region’s five populations of protected California red-legged frogs seem to have been hard hit by the fire, though at least some did survive. The New York Times reported on Tuesday that wood rats also suffered large losses. Now that the fire is fully contained, park scientists are starting to think about recovery. As NPS restoration ecologist Joey Algiers told Earther, one issue after a major disturbance like this is that invasive plants—for instance, fast-growing annual grasses—can move in and displace slower-growing native shrubs. NPS staff assessing damage after the Woolsey Fire. Scorched landscapes like this are common across the Santa Monica Mountains. If invasive grasses do start to become established, something Algiers described as a key concern here, they can make the landscape more fire prone by loading it with quick-burning fuel. Ecologists hope to give native flora a leg up through restoration work, including collecting and propagating native seeds and removing invasives as they crop up. Local volunteers will have a big role to play in these efforts in the weeks to months ahead. Ideally, an ecosystem like this would have decades to recuperate before the next fire hits. But the Springs Fire struck the same region just five years ago, burning about 24,000 acres across the Santa Monica Mountains, mostly in the National Recreation Area. Before that, there was the Green Meadows fire, which singed 38,000 acres in 1993. In a recent update on the fire damage in the Santa Monica Mountains, the NPS put the situation plainly: “Current fires (more than every 20 years) are not natural.” With humans igniting more fires, invasive species creating more fuel, and climate change further priming landscapes to burn across California, it’s unclear whether a long recovery period is in the cards this time around.